Star-hopping is one of the most valuable skills in amateur astronomy. In the days before computerized mounts and GPS, star-hopping was the only way to find interesting objects. Thanks to the steady march of technology, not as many amateurs today are proficient star-hoppers. In fact, quite a few amateurs have never star-hopped. Still, for many of us without computerized mounts, star-hopping remains a critical skill. Washed-out skies in particular can really test your star-hopping skills: when only 3rd or 4th magnitude stars are visible, it can be a pretty long hop from the nearest visible star to your target. Even if you have a computerized mount, star-hopping can be useful in light-polluted skies: with many faint fuzzies at the ragged edge of visibility, star-hopping techniques can confirm that you are indeed looking in the right place. There are three prerequisites for this series of star-hopping tutorials. The first is that you need to be able to find your way visually around the brightest stars in night sky. I don’t mean that you need to recognize every single constellation, but you should be able to identify the primary constellations as well as the first and second magnitude stars that are reliably visible in all but the most extremely light-polluted skies. If you can’t do this, go out on a clear night and explore the sky with just a planisphere or monthly sky-map (no telescopes or binoculars allowed). 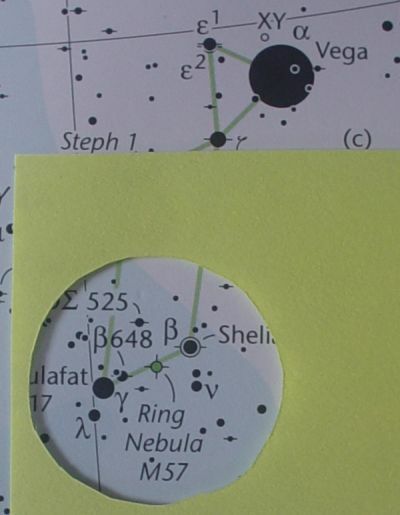 You can buy a planisphere at Amazon or download what you need to make one from Sky & Telescope. Or you can download a very good monthly sky-map from SkyMaps. Start by finding some of the really distinctive constellations (e.g., the Big Dipper, Pegasus, Orion, or Cygnus), or conversely start with the brightest stars you see in the night sky and try to figure out which stars they are on the planisphere—or better yet, do a bit of both. After a couple of nights, you’ll soon recognize the major stellar landmarks. The second prerequisite is a basic star atlas that goes down to at least 6th magnitude and ideally a bit beyond. I’ll use Sky & Telescope’s Pocket Sky Atlas throughout these tutorials. It meets our star-hopping needs very nicely, and it is inexpensive and widely available. I highly recommend it. The third prerequisite is a small finder telescope of some kind (or binoculars). While you can star-hop pretty well with a telrad in dark-skies, in light-polluted skies you really need a finder scope. If your light-pollution is at all significant, you simply won’t see enough stars to be able to star-hop effectively with a telrad (see my article on finders). However, the basic techniques are the same whether you are using a telrad or a finder. If you are fortunate enough to have dark-skies, just follow the tutorial and mentally substitute “telrad” whenever you read “finder”. This tutorial also applies quite directly if you are using binoculars. Just substitute “binoculars” whenever you read “finder”. When you are getting started in star-hopping, it is useful to have a simple way of understanding how much sky you can see through your finder. The easiest thing to do is to take a piece of paper and simply cut out a circle of the appropriate size (the Pocket Sky Atlas has a scale on the inside front cover that you can use to figure out how big to make the circle). Most finders have a 5 or 6 degree field-of-view, so you can use that as a reasonable guess if you don’t know your finder’s field-of-view. Once you are experienced at star-hopping, you’ll have an intuitive feel for this and you won’t need the template. The first thing you must do is figure out which relatively bright star to start your star-hop from. 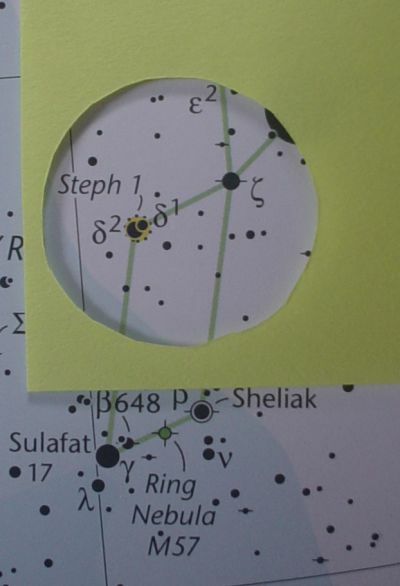 To do this, find the target in your star atlas—M57 in this case—and find the nearest reasonably bright star. Looking at the figure below, you can see that in this case Vega (α Lyr)—one of the brightest stars in the sky—is nearby and the perfect place to start our star-hop. 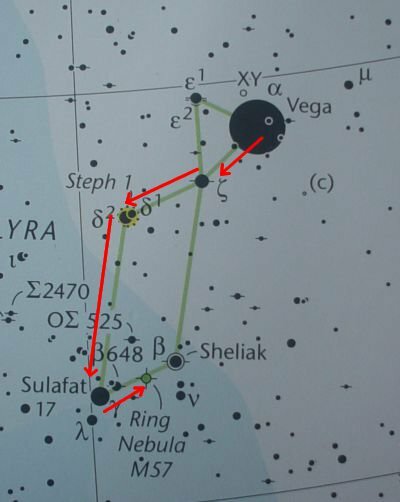 We’ll get from Vega to M57 by going via ζ Lyr, δ Lyr, and then to γ and β Lyr. 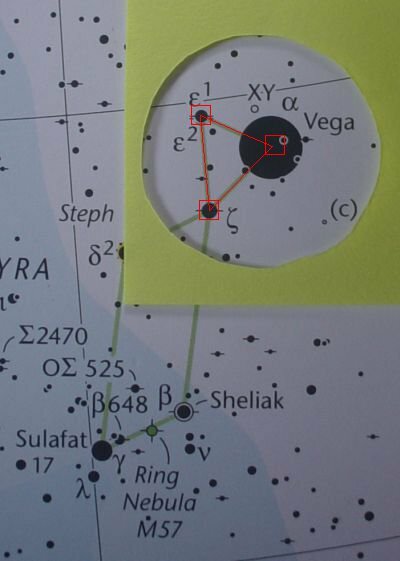 So start by pointing your telescope at Vega and centering it in the finder. In the case of Vega, there isn’t much to confirm, but in general it is important to always confirm that you have indeed pointed your telescope at the correct star. It is also important to figure out the directions as you see them in the finder. The way to do this is to check what your atlas indicates you should be seeing against the view in the finder. The figure below on the left uses the field-of-view template to highlight what you should see. 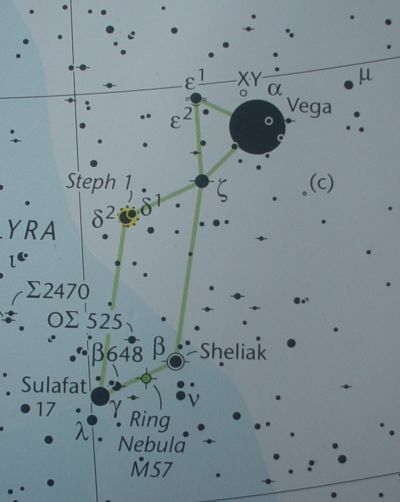 Notice a very distinctive triangular star pattern, formed by Vega, ζ Lyr, and ε Lyr (the double-double). These stars are highlighted in the figure on the right. Vega is clearly the brightest of the three, and you can tell ε Lyr apart from ζ Lyr because ε Lyr should be clearly visible as a double star in your finder. We’re most interested in ζ Lyr because it points us in the direction of δ Lyr. Determining your orientation is important because constellations change orientation in the sky from season to season and your view is unlikely to exactly match the way the chart is oriented in your atlas. It is particularly critical to do this if your finder doesn’t show a correct, upright image. If your finder shows an inverted or left-right transposed view, at every step you need to carefully confirm the orientation of what you really see relative to the atlas. Don’t trust left-right or up-down; always move relative to the star patterns you see in the finder. Having identified ζ Lyr, we get to δ Lyr by moving approximately along the line from Vega to ζ and continuing on. 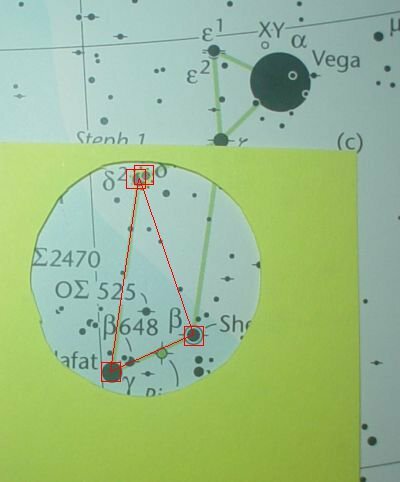 Vega should exit your finder’s field-of-view and a star roughly as bright a ζ Lyr should enter your field-of-view on the opposite side, as shown in the figure below on the left. You can confirm that you have indeed reached δ Lyr because you should see δ Lyr clearly as a double star that aligns with ζ Lyr, as highlighted in the right-hand figure below. Having found δ Lyr, you now need to go “down” to γ and β Lyr. The question is, what direction is “down”? The answer is in the star-pattern: if you drawn an imaginary line from δ to ζ Lyr, “down” is on the opposite side of the line from where ε Lyr is. If you need to, back up towards ζ Lyr enough that you see ε Lyr again, then go back to δ Lyr and move roughly perpendicularly to that imaginary line, but towards the opposite side from ε Lyr. If you got it right, you’ll soon see two stars brighter than δ Lyr enter your field-of-view, as shown in the figure below at left. The bright triangle pattern with δ Lyr at the apex (highlighted on the figure on the right) confirms you are there. Having found γ and β Lyr, point your finder approximately between the two, as shown in the figure below. That may be enough to place M57 in your main scope’s field-of-view, but let’s do a more precise job of pointing the telescope. To do this, we’ll identify a few more stars to help us. Let’s begin by confirming which of the two stars is β Lyr and which is γ Lyr (remember, if your finder inverts or otherwise transforms the image, it may not be immediately obvious which one is which). Notice that γ Lyr has a star near it, roughly on the line towards β Lyr. It also has another bright star (λ Lyr) just past γ Lyr on the line taking you from δ to γ Lyr (back up to include δ Lyr in the field-of-view if you need to confirm directions). Similarly, β Lyr has two stars below it (one of which is ν Lyr), where “below” means “on the same side of the line connecting γ and β Lyr as λ Lyr”. These two stars roughly point back at β Lyr. Finally, there is one more relatively bright star (OΣ 525 on the chart) located a little ways back toward δ Lyr that forms an approximately equilateral triangle with γ and β Lyr. Having identified these stars, now look at the intersection of the following two imaginary lines: the first line is from γ to β Lyr; the second line is from ν Lyr to OΣ 525. Point your telescope at this intersection, and then move little bit further towards γ Lyr along the line connecting γ and β Lyr, and then move just very slightly below that line (“below” meaning “toward the side that ν and λ Lyr are on”). These stars are highlighted in the figure below. Now look through your main telescope. Assuming your eyepiece has a field-of-view that isn’t too narrow, M57 should be right there (be sure to use at least 40x, otherwise M57 might be too small for you to notice it). If M57 isn’t there (and I would be surprised if it isn’t), note the star-field you see through the main telescope and very gently sweep left, right, up, and down, always going a little ways in one direction and then back-tracking to return to your original star-field. You want to sweep very carefully, coming back each time to where you started because M57 can’t be more than one field-of-view away—if you don’t re-set each sweep to your original starting point, you’ll soon have wandered far away and you’ll have to re-start the star-hop. I hope you enjoyed this first star-hop lesson. Once you have M57 in view, center it in the main telescope and go back and look through the finder and note exactly where the finder is pointed. This will help you if you accidentally loose M57 while changing eyepieces. Practice moving away from M57 in the finder and then pointing back at M57 until it is reliably centered in your main telescope every time. Assignment #1: Having found M57, go back to Vega and try the star-hop again, but this time go from ζ Lyr directly to β Lyr, without going via δ Lyr. Assignment #2: Find the double cluster (NGC 884/NGC 869) starting from α Per. Hint: go from α Per to γ and τ Per, then to η Per, and then on to NGC 884/NGC 869. Submitted by Anonymous on Thu, 2012-06-21 11:37. This is exactly what I've been looking for. I live in a city where I can barely see mag 4.0 stars on a good night. I have printed out your tutorial and will use it when the next clear skies are available. I especially like your idea of using a cut-out circle - and I also have the S&T Pocket Sky Atlas. Submitted by Rayne on Fri, 2012-06-22 17:30. Submitted by Anonymous on Fri, 2012-06-22 20:25. Please continue your star hopping tutorials. They are very useful. Submitted by Washed-out Astr... on Sat, 2012-06-23 14:16. I haven't been updating much recently because life has been keeping me rather busy. But I have another tutorial in the works and I promise to get it up soon. Submitted by Anonymous on Sat, 2013-11-02 22:41. I live in Houston, TX. Light pollution is pretty much as bad down here so this was very helpful. I'm glad there's a website for light polluted area astronomers. Submitted by Anonymous on Tue, 2014-12-23 10:50. Much much more satisfying than using "GoTo" - and quieter ..